A gaggle of Canada geese crosses a path in Cincinnati’s Sharon Woods. Photo courtesy: Konstantin Vasserman. A year ago today, the celebrated level heads of US Air Flight 1549’s captain and crew brought Americans together around a rare and villain-free moment of heroism. The plane had flown from New York’s La Guardia Airport into a flock of geese, lost the use of both engines, and landed safely on the Hudson River, saving 155 lives. But the near-disaster shook the waters of animal policy-makers. Representatives of ecology, animal protection, and hunting interests, long at odds over how human cities should treat geese, lobbed opposing arguments through the media for months. Today, the accident’s lingering fallout reveals the vastly different ways of seeing geese that underlie those arguments, and make it hard for people to find common ground around wild animals. After the accident, New York City officials were quick to declare their commitment to preventing future goose airstrikes. But the city faced the task of somehow cracking down on a problem they had already been battling for years: large birds sharing New York City’s airways. Despite the use of techniques both lethal (shooting and gassing), and non-lethal (harassment and abortive “egg-addling”) to keep geese away from airports, the number of wildlife airstrikes increased from 1,759 in 1990 to 7,666 in 2007. So the scuttled engines were returned to Cincinnati for analysis by their maker, CFM International, which confirmed that the engines had indeed been jammed by birds. 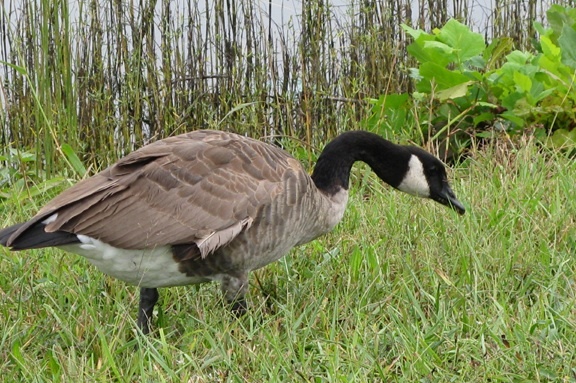 CFM mailed their remains to the Smithsonian Institute’s Feather Lab, where scientists used DNA analysis to identify the tissues as hailing from Canada geese–two females and one male. And then, because of the accident’s high profile, they tried a new technique to learn more about the birds. At different geographic latitudes hydrogen atoms have different numbers of neutrons, so the feather experts looked closely at atoms in the tissue samples, to understand where they had come from. What they found indicated that the birds had recently consumed hydrogen in Canada’s northern province of Labrador. Why was this important? Because it showed that Flight 1549 had sucked members of a migratory flock into its engines, not the resident New York birds whose presence and droppings had provoked years of public controversy. Hailed as an important clue for managing birdstrikes, this finding was published and discussed during four months of meetings among New York’s government and transport authorities. Some New Yorkers were therefore taken aback by the city’s response, which was to catch and gas up to 2,000 of New York City’s resident geese. “We are sending some of these geese for a well-deserved rest up in the sky, wherever geese go,” New York’s mayor Michael Bloomberg was quoted as saying. Maggie Brasted, Director of Urban Wildlife Conflict for the Humane Society of the United States (HSUS), explained the discrepancy between the Feather Lab’s finding and the city’s action, as “political cover” for lethal measures that the public had never supported. To Brasted, Flight 1549 underscored the failure of lethal methods on Rikers Island, a prison site near La Guardia Airport whose landscape attracts large numbers of geese. HSUS hired a landscape architect to recommend landscaping changes to the island, she said, but the city had never responded. But Martin Lowney, Director of New York’s Wildlife Services, the agency paid to exterminate the geese, saw the city’s failure to reduce geese numbers as evidence that more lethal control was needed. The disparate conclusions of voices such as Brasted’s and Lowney’s, given the same information, help explain what shapes New York City’s policy toward geese: values driven by political pressure. Both spokespeople made it clear that their perspectives on goose control were formed before–not in response to–the Feather Lab’s findings. This begs a question: how exactly did the policy players who shaped the city’s response, value the geese who bore its brunt? New Yorkers protested the killing as both ineffective and inhumane, placing an implicit value on the birds’ well-being. But official policy voices almost uniformly resisted discussing humaneness as a relevant policy concern. Curiously, Wildlife Services director Lowney was the only spokesperson interviewed for this article who would comment on humaneness. He said he was present for the death of one batch of geese. Actually, he admitted, there were no windows in the gas crates to let him see the birds, but he could hear them “talking” after the gas was poured in; within five minutes, he said, the talking stopped. If humaneness was not central to the debate over killing New York City geese, what was? 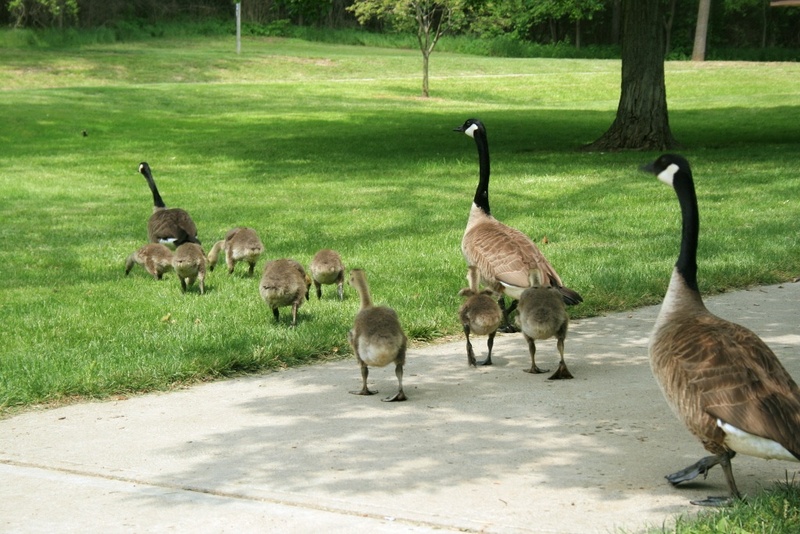 As Wildlife Services Director, Lowney was most attuned to the recreational value of geese. For hunters, geese are a key part of their sport, and hunting license sales are a key part of state wildlife agencies’ budgets. Furthmore, said Lowney, to outdoorspeople in general geese are simply beautiful to look at. But that aesthetic value is limited by overabundance. Geese are beautiful, but they’ve become so abundant that people aren’t enjoying them anymore. Brasted of HSUS took a different view of geese. Independent of their value or bother to us, she said, they are valuable to themselves. They’re just animals living their lives. No matter whether an animal is common or rare, whatever label you give it, every animal feels pain, and has the right to exist to live its life. To the Smithsonian’s Marra, the value of geese depended on the place they occupied within ecosystems. As spokesman he emphasized the importance of basing management policies on detailed information. But in an interview his goals were much more specific: protect migratory birds and eliminating resident birds. It’s essential to continue to reduce resident populations, but I would never advocate for the removal of a natural process, system or behavior, to minimize bird strikes. In this case, there’s a clear line between resident geese and migratory birds; [resident geese] are not natural. David Feld of GeesePeace saw the geese’s role in Flight 1549 as part of another larger issue. In accordance with Geesepeace’s goal of helping communities solve goose problems collaboratively, Feld viewed each conflict as an opportunity to draw upon humans’ finer qualities, including compassion. Personally, I think it’s very important that what we do is an expression of the best of the human spirit. . . Our goal is better communities. And we get there by considering the means as well as the ends. While the fate of New York City’s geese was argued along lines of “the numbers,” numbers did not drive the argument. Like most public debates, this one was driven by values–by distinct notions of what makes a goose worthwhile. Similar questions of how (and whether) to coexist with deer, coyotes, and other wild animals arise almost weekly in Cincinnati’s newspapers and community bulletins. If we can pay closer attention to the ways that we and our neighbors value these different animals, we will be better equipped to guide each other towards consensus decisions honoring safety, compassion, and the diversity of other values we place upon our community’s animals. This entry was posted in Editorial, News and tagged air strikes, bird strikes, Canada geese, CFM International, David Feld, David Weprin, ecological value, egg-addling, Feather Lab, Flight 1549, gassing, geese, GeesePeace, HSHS, hydrogen isotope analysis, instrinsic value, La Guardia, Laborador province, Maggie Brasted, Martin Lowney, MIchael Bloomberg, migratory, New York Wildlife Services, Peter Marra, recreational value, resident geese, Rikers Island, Smithsonian Institute, wildlife conflicts. Bookmark the permalink. ← Editorial on Issue 2: What does it mean to care for an animal? Good article! I lived in New York at the beginning of this controversy, and for me, the issue is two-fold: Is there any way to preserve life (both human and goose)? And if not, is our “solution” humane? Considering the intrinsic value of the geese does not distract from considering the humaneness of the way the geese are killed. If the geese need not be killed, then we must stop killing them. If they must be killed, then we must do so as humanely as possible. I applaud HSUS for keeping the focus on the ability of communities and geese to coexist peacefully. Had HSUS weighed in on the method that officials used to kill the birds, the organization would have been implicitly accepting the assumption that they needed to be killed in the first place –and that’s something I don’t think anyone has demonstrated, particularly given evidence that these geese were migratory, not resident.